Here's a guy who will trade you his cool looking Royal Enfield motorcycle for $1 and a pickup truck. 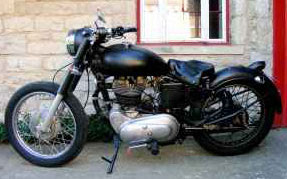 That's the offer made by a seller in Columbus, Ohio, who has been advertising the Royal Enfield Bullet on CraigsList for $1,600. But what he really wants is a truck. A truck? Sounds as if someone's dream died, doesn't it? But it's not quite that sad, it turns out. "I have owned a lot of vintage bikes and scooters and this thing gets more attention than all of them put together. Seriously, every traffic light the guy next to you will ask you what it is, and every time you park it on the street groups of people will gather around it. It's only got 6,000 miles on it! "I want a nice pick-up truck as a work/commuter. I own a shop and I am always renting trucks to move fixtures and I am also renovating a house right now. The lower the miles the more interested I am. Would prefer a Toyota/Mazda/Nissan but would take a nice Ford or Chevy." "I am also looking for a really small (100-200cc) CB project bike, so in a perfect world you give me a small great pick-up truck and a busted CB125 for the Enfield. I would also put some cash into the deal for the right truck." Hopefully, his dreams will come true.